Here you will find a journal based on the life of a Hispano Arabe filly named Reannon as well as plenty of pictures. Enjoy! This is Reannon. 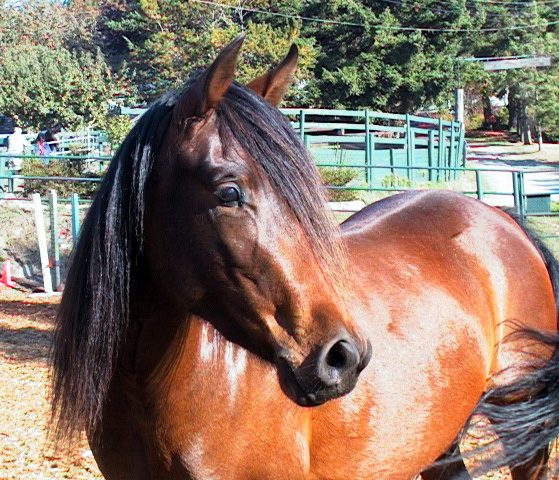 She is a 2000 Andalusian Arab cross filly...also commonly known as a Hispano Arabe. My name is Nicole and as of May 24th, 2002 I am now owned by this gorgeous filly. I am also owned by an Anglo Trakehner gelding named Bruderchen who has his own homepage which you can visit by clicking on his name. Reannon's sire was the Andalusian stallion Valerio (Lisonjerio x Banbury Heather), and her dam is the Arabian mare Vienese Waltz(DWD Tabasco x Heaven Scent). She stands approx. 15hh at the moment...and has already passed both her parents in hieght, my hope is thst she will make 15.1hh...might be wishful thinking. As you can see she is a gorgeous bay and although you can't see them in the picture she has white flecks of hair in her flanks. Another unusual trait she has is what is called a Ventral Mane. There is a picture of her ventral mane in the pictures section of the homepage. Click here to visit thier site!